Micro is RoadPilot's most discreet GPS speed warning system. Like all RoadPilot products it uses the latest GPS technology and comes ready loaded with RoadPilot's industry standard database of speed camera locations and accident black spots. When approaching a safety camera a visual and audible warning is given at the same time, the display indicates the permitted speed AND your actual speed. It also indicates how close you are to the camera. Visual and audible alarms are given in respect of mobile lasers. RoadPilot Micro has been discontinued. Micro has inbuilt intelligence - it's directional i.e. it won't warn you of speed cameras that are on the other side of the road. It's also speed sensitive. Unlike other speed detection devices, the Micro will only advise you to slow down and flash an alert if you are travelling above the speed limit, otherwise you will simply hear a simple beep. As well as being the world’s most discreet GPS speed warning system, the micro is packed full of useful features. RoadPilot Micro is ready to go - straight out of the box. RoadPilot Micro has two types of mounting arm, straight and right angled. It can be hard-wired to be even more discreet. Speed Extremely accurate display of speed and compass heading. Speed and range user selectable to kilometres or miles per hour. Warning Shows speed limit around hazard area and countdown range. Only alarms if you are exceeding the limit. Camera range Depicting range (in miles and yards or metres) and the arrow indicates the approximate bearing of the nearest camera. Compass Heading Indicates vehicles speed and rotating compass "head up" display according to direction of travel. Rescue ME Shows your position which can be used to inform emergency services where you are. Satellite status Providing a visual indication of the number of satellites received and relative signal strength. Trip computer Illustrates odometer and trip. The trip is user reset-able and can display miles or kilometres. Date and time micro’s GPS receiver receives extremely accurate information from an "atomic clock" providing precise time as well as showing the date. The tiny RoadPilot Micro makes more sense than its bigger brother, which is complex and bulky. The RoadPilot Micro has the smallest screen in the market but uses it well, a single button toggling easily to the required display. RoadPilot Micro is a HARD WIRED product an optional plug-and-play cigarette lighter adaptor is available. The compact unit (65x50x70 mm), fits on an adjustable, dash-top mounted arm. The 1.8 inch (42 mm) screen is housed in a distinctive designer casing finished in a stylish all-black, with a clear, backlit display for ultimate clarity at all times. Perfectly discreet installation is a major advantage of the RoadPilot Micro. 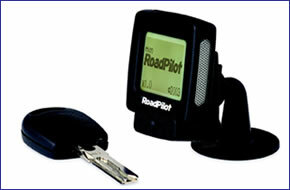 RoadPilot Micro comes ready to use right from the box. It’s pre-loaded with our latest database of fixed speed cameras and accident black spots. As we add new camera locations daily - new road works, new cameras etc, you can update your RoadPilot on-line whenever you want. The first 6 months access to the RoadPilot database are free. After 6 months you can subscribe to the database - so that you are always up to date. At a cost of less than £1 per week, you get the peace of mind that only the UK’s best speed camera database can deliver.